Despite finally reaching the end of what was a frenzied portion of their schedule, the Sharks found the necessary vigor to get past the NHL’s top team on Friday night at SAP Center. 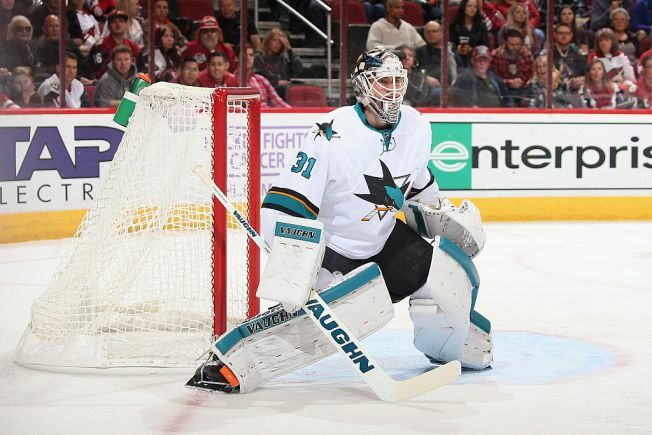 Martin Jones outdueled Carey Price in net, and the Sharks got first period goals from Brent Burns and Joe Pavelski in a 2-1 win. The Sharks (15-9-1) improved to 6-1 in their last seven games, allowing just eight goals over that span. They lead the Pacific Division by three points, and won’t play again until Wednesday after what was their 10th game in the past 18 days. Montreal remains in first place overall in the league standings with 34 points (16-6-2). Two of the Sharks’ most potent goal scorers staked them a 2-0 lead before the first intermission. On a power play, Burns powered a one-timer from the circle past Price at 5:22. San Jose came out of the gate buzzing, and earned the man advantage when Micheal Haley drew a holding minor on Mark Barberio. Pavelski increased the San Jose lead at 19:03, storming towards the goal crease and redirecting a Joe Thornton centering pass on what was essentially a two-on-none rush. The Sharks were shorthanded late after a double minor for high sticking to Logan Couture with 4:06 left in regulation, when the Sharks forward clipped Alexander Radulov, who left the ice due to some profuse bleeding. After killing off a good portion of it without allowing a shot on goal, Artturi Lehtonen swept a shot through Jones with Price pulled for an extra attacker with 1:17 to go. That was all the Canadiens would get past Jones, though, who made 31 saves. Montreal made a push in the second period, particularly early, but Jones stood on his head. He snagged a Max Pacioretty shot about five minutes into the middle frame, and on the ensuing faceoff got his left pad on Brenden Gallagher’s attempt after the Canadiens forwards slipped to front of the net with the puck. Jones got a bit fortunate, too, when Pacioretty missed a wide-open chance in the slot halfway through regulation. The Sharks won their 10th straight game over the Canadiens in San Jose, and are 7-1-0 in their last eight overall when opposing Montreal. Montreal has not won a game at the Shark Tank since Nov. 23, 1999. The Sharks went 1-for-3 on the power play, and are 5-for-19 in their last seven games. Of Burns’ 10 goals, three have come with a man advantage. Montreal finished 1-for-4. The Sharks have allowed one power play goal against in four of their last five games. After getting pulled against Pittsburgh on Nov. 5, Jones improved to 8-2-1 in his last 11. He’s allowed two or fewer goals in eight of them. Jones’ best save of the night came with 11:29 to go in the first period and the Sharks ahead 1-0, when he caught a Alex Galchenyuk shot while quickly shifting from his right to his left. He also denied Brian Flynn on a breakaway with 2:53 left in the opening frame. Price has now lost all five of his starts in San Jose (0-4-1). It was just his third loss in regulation this season (13-3-1), as he allowed two goals on 28 shots. The Sharks lost defenseman David Schlemko with about eight minutes left in the second period with what looked to be a leg or ankle injury. Thornton assisted on each of the first two goals, moving into sole possession of 25th place on the NHL’s all-time scoring list with 1356 career points, passing Brendan Shanahan. Tommy Wingels returned from a three-game absence with a lower body injury, replacing Ryan Carpenter, who had played the previous three games and scored his first NHL goal on Wednesday in Los Angeles. Paul Martin played in his 800th career NHL game. The Sharks will host the Ottawa Senators on Wednesday for the first of two meetings this month. They will enjoy a rare two-day break over the weekend with no practices scheduled.